This is announcement of MECA Picnic 2017. 2. MECA Members are strongly advised to register within the deadline for smooth arrangement of the event. 3. MECA EC strongly discourages “On-Spot Registration”. As it is impossible to estimate the number of people, who will register on spot, EC cannot guarantee availability of picnic meals for members. 4. Members can register for picnic w.e.f. 20th January 2017 from MECA Office (MECA Office at House 135, Road 5, Mohakhali DOHS, Dhaka) & / or from the Reception of Cadet College Club (H # 14, Rd # 9, Gulshan 1, Dhaka-1212) on cash payments. 5. Members can also register and pay subscriptions online from MECA website. 6. Detail program of picnic is will be announced shortly. 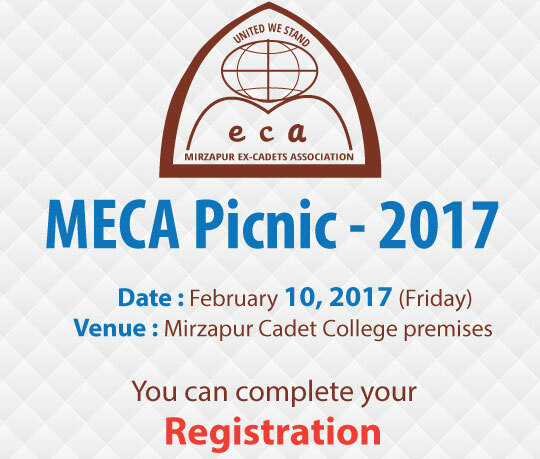 Let us have a vibrant MECA Picnic 2017 with maximum participation by MECA Members.